DETROIT — Former Shrine Catholic High School standout Alex Cavazos will be taking his talents to Detroit, to play collegiate golf, of course. 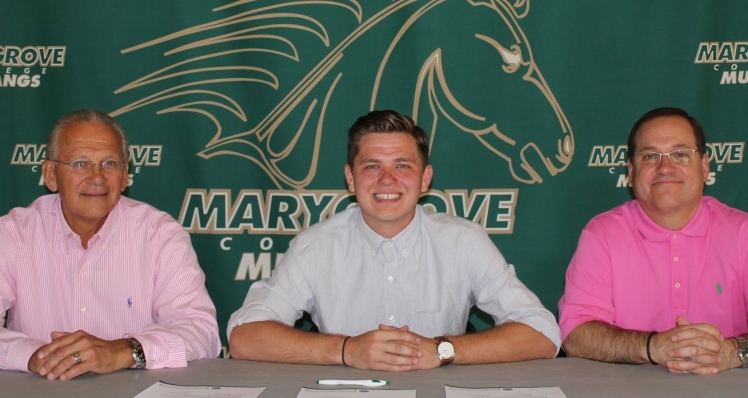 A former NAIA basketball player, Cavazos committed to another NAIA school, this time to play golf for Marygrove College â a four-year private school situated in northwest Detroit. The signing helps the Mustangs fill out a 2015 roster that is primed for a breakout campaign behind junior cornerstone’s Michael Kanalas and Tyler Newell and a cast of newcomers. Cavazos, a 5-10 two-sport student-athlete, committed to play for the budding Mustangs golf program this fall after signing his Letter of Intent on Thursday (Aug. 6). With a minimum of one more signing expected before the fall season, Marygrove men’s golf is primed to have a breakout season under the leadership of head coach Frank McAuliffe and assistant coach Ronnie Pollack, Jr.
Pollack has been the lead recruiter for the Mustangs over the past two seasons. A transfer, Cavazos is familiar with the Wolverine-Hoosier Athletic Conference after spending three semesters at Aquinas (Mich.) on the men’s basketball team. Cavazos already paved a stellar path as a student-athlete prior to his days at Aquinas and signing with Marygrove at nearby Shrine Catholic High School in Royal Oak, where he was a two-sport star and 2010 graduate. During his time at Shrine, Cavazos made a name for himself by becoming a member of the MHSAA All-State Team on two occasions on the hardwood while earning the same distinction three times during a four-year varsity golf career.